Well we made it. Friday morning Tommy’s BP had been acceptable for 10 straight hours. Really good. Like normal people. 124 over 78! We finally found the right cocktail of meds. And I want to thank all of the nurses, especially Debbie at OU. Part of the anxiety and stress is the not knowing. And this beautiful woman shut the door and sat down and explained everything and wrote it down. They released him right after lunch and we headed to the pharmacy and got his new meds and then home for a nap in his own bed and a nice soak in the tub. He was determined to go to Corbin’s first dance. And we made it. I was working the photo booth and he helped by corralling the props and herding the kids into a somewhat straight line. The gym looked amazing, the DJ was really good, but the hottest ticket in the gym was the photo booth. Those three little munchkins are best friends. Last year they were all the same height but as you can see Corbin had a growth spurt, but then we are all tall Viking people here. 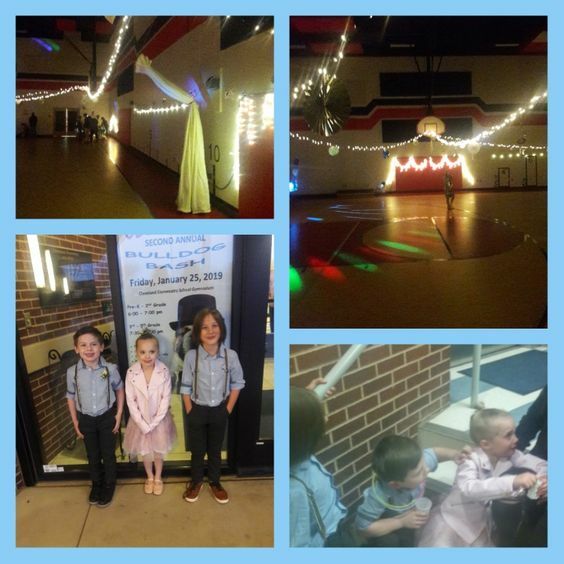 They danced their hearts out and took tons of pictures together and ate a lot of cookies but when it came time to go, little Alex did not want to take off her party shoes and go to her Grandmother’s house. She started to cry and the boys jumped right in to hug her and console her and offer for her to come with them. On the way out, Corbin said, ” Grandma, Emerson and me are cousins now.” Really? ” Well then it’s okay if he calls me his Grandma too, then?” Uh, no. I sent his dad a the above picture as he was home with Charli Ava and he wrote back, Good Lord Mom, he looks like a little Amish boy! Actually the boys had to have matching outfits, which were located finally at H & M. Corbin refused to wear the bow tie or boutonniere, as they felt funny on his skin. We slept like the dead last night and woke up this morning feeling like we had the worst hangover ever! We didn’t realize how tightly we were wound up and I guess we just crashed finally. But everyone is doing well. Monday we meet with the surgeon at the Cancer Center and we’ll go from there. But I had to share Corbin’s first dance with y’all and thank you for all of your thoughts and love and prayers. You are all amazing! Posted in: Anxiety, Humor, Kindness, Life, Love | Tagged: BulldogBash, Health Updates, Thank You! That’s great that things are going in the right direction. I bet he was glad to be back in his own bed. Wishing all the best for the next step. There is nothing like your own pillows and bed! Thanks so much! Yes, it’s certainly nice being in your own bed, with your own pillows. We are so grateful for it too! Good blood pressure, being taken care of by an awesome nurse, a first dance with besties, being in your own bed!! Wow!! What a whirlwind! My heart rejoiced with you as I continue to pray for you. The ups definitely outweigh the downs. Thank you for the prayers. WE appreciate them. So happy to know this good news, wishes for everything to be very good always. Short lived. Last night his BP crashed to 90 over 40 and he stood up and passed out and hit the wall. I was terrified. He came to after about 10 seconds and then threw up on my rug. He’s back at hospital.